Altruist Consult assumes its credibility and quality of services by the validation of US Small Business Association and General Services Administration’s multiple prestigious certifications. We take pride in the unrivaled quality and perfection in out governmental projects. Also, by introducing diversity in our workforce, we are pioneering the American values along with technical expertise. As a winner of the DBE certification, Altruist Consult is eligible to meet minority business participation goals on state-funded contracts issued by the State of Maryland, contracts funded by counties and cities within Maryland that accept MDOT’s certification for their minority participation programs, and federally-funded contracts issued by the U. S. Department of Transportation. This certification has open new doors for us to participate in the state and federally funded projects. Altruist Consult is part of the Maryland Department of Transportation (MDOT) directory of certified firms is intended to be used as a guide for identifying certified Minority (MBE)/Disadvantaged (DBE)/Small Business Enterprise (SBE) firms and Airport Concession Disadvantaged Business Enterprise (ACDBE) firms to utilize on State and/or USDOT assisted contracts. We carry out contracts with the Department of Transportation, the Airport Authority and numerous governmental entities. 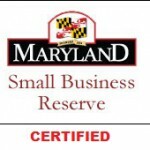 We are proud to announce that Altruist Consult has been awarded Maryland’s Small Business Reserve (SBR)Certification. This certification, part of the Small Business Reserve Program, will enable us, as a certified small businesses, the capability to bid exclusively on specified State of Maryland contracts.